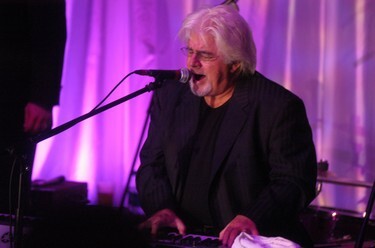 Michael McDonald, shown here at last year's Barnstable Brown Gala, will be back to party and entertain tonight. Copyrighted Herald-Leader photo by David Perry. The Barnstable Brown Gala clocks in as the last of the big Derby bashes to announce its guest list, releasing it less than 24 hours before the first attendees arrive. Tricia Barnstable Brown and Priscilla Barnstable put together a list, as reported by Louisville's Courier-Journal, that includes music, film, TV and sports stars. Edward Norton, soon to be in a theater near you as The Incredible Hulk, leads the list of screen stars on this, the opening day of summer blockbuster season -- I can't get this Black Sabbath tune out of my head for some reason. We've also got a Kentuckian coming home in Murray-native Molly Sims of NBC's Las Vegas fame. Also on their ways are Jerry O'Connell and the 10, Bo Derek. "Reality" TV has been a bigger and bigger deal at Derby events in recent years, and Hugh Hefner will be the marquee attraction this year bringing his Girls Next Door series to the gala. Heidi Montag and Spencer Pratt of MTV's The Hills will also be in the house. Also from TV land are chef Bobby Flay and FOX News' Bill O'Reilly. 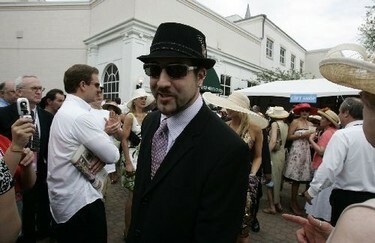 Joey Fatone of 'N Sync and Dancing with the Stars fame will be there. Will he sing, dance, or both? One of the big questions is always who will be playing with the band and there are, of course, some old friends in the lineup, including Michael McDonald, Taylor Dayne, Smokey Robinson and Travis Tritt. They can show some newcomers, including Anastasia Brown, Lee Ann Womack, and Darryl McDaniels (the D.M.C. in Run-D.M.C.) how it's done in Louisville. Rounding out the musical guest list are Supremes singer Frances Mary Wilson, Nick and Drew Lachey, Eddie Money, and his daughter Jesse Money. New England Patriots quarterback Tom Brady has become a regular, and he'll be there along with fellow Patriots such as Randy Moss and Teddy Bruschi. Dallas Cowboys wide receiver Terrell Owens, who makes more headlines than corduroy pillows, will also be at the bash. If you like golf, you have Ryder Cup captain Paul Azinger and ski fans can look forward to Bode Miller. The twins, former University of Kentucky cheerleaders, will also show some love to their alma mater, bringing in the University of Kentucky Dance Team to perform. 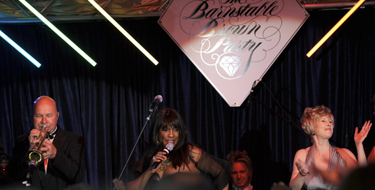 The party benefits Barnstable Brown Diabetes Research Labs at UK and the University of Louisville. Of course, last year's marquee star was Louisville's Larry Birkhead, fresh from winning the custody battle for Dannielynn, his and the late Anna Nicole Smith's daughter. Birkhead and Smith met at the 2004 Barnstable Brown Gala, re-emphasizing the point that you never know what will happen on Spring Street on Derby Eve. Those crazy Hills kids, Heidi and Spencer, don't seem to be too interested in sleep while they're in L'ville. Post race, they're hosting an invite only soirée sponsored by Puglisi Racing at the Raw Sushi Lounge on South Fourth Street. Their guest list will include Kid Rock, Tara Conner, Kevin Federline, Jenny McCarthy, Birkhead and others. The Copleys are for Colonel John, the man and the Horse. 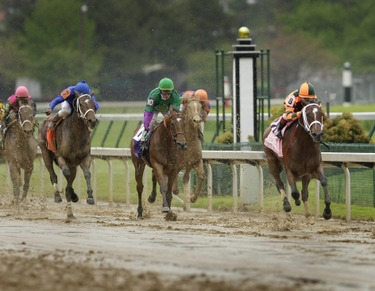 The Horse is listed at 4-1 in Saturday's Kentucky Derby. Here, exercise rider Karine Lhuillier takes him out at Churchill Downs on Wednesday morning. Copyrighted Herald-Leader photo by David Stephenson. It starts with the name. Monarchos worked well for me in 2001. 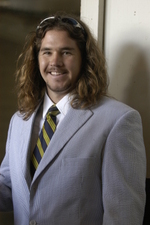 The initial attraction was the similarity of his name to the mascot of my alma mater: The Old Dominion University Monarchs. Then there were little extras, like he was sired at Pin Oak Stud, owned by Josephine Abercrombie, an area arts supporter I had enjoyed meeting a few months prior to the race. And the breeder was former newspaperman Jim Squires, who I enjoyed reading. It only made sense to put a few bills on him, and enjoy a subsequent payday, as I did. A similar thing happened in 2005 when 50-1 longshot Giacomo finished the day draped in Roses. The initial attraction was that I'm an opera guy, and Giacomo is the first name of one of opera's greatest composers: Giacomo Puccini. And that was actually part of the story behind the horse's name. The other part was that his namesake was actually the son of Sting, one of my favorite pop musicians, and Sting had named him after Puccini. How cool. 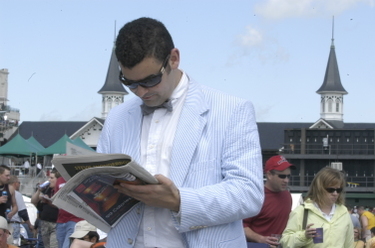 So whenever the Derby field starts coming together, I look for a name to jump out at me. This year, one jumped out to me, my mom and my sister: Colonel John. My Uncle John was a Colonel in the United States Air Force. What's more, Uncle John lives in Los Angeles, and Colonel John is a California Horse -- usually, I like going with Kentucky Horses, but sometimes you get derailed. It is fun to hear the day-after stories about all the people celebrating at a farm around here when their horse wins. Then, I read that Colonel John's trainer, Eoin Harty, is apparently a Yankees fan. My team -- we are NOT discussing this season, yet. I may have to wear my Yankees cap Saturday. Anyway, obviously I will put a few bills on the Colonel, and my sister is even betting for the first time. Like a lot of people, I usually go to the track carrying the wagers of several family and friends. I'm also going to have to put some scratch on Z Fortune (copyrighted photo, right, by David Stephenson), because our fabulous development writer Beverly Fortune and I have covered so many Barnstable parties and similar functions together. George Zack also signs his notes Z, and since this is such a big year for him, there could be something cool about a Z horse coming in. And then, I just read this piece that makes a good case for Z Fortune coming up big Saturday. Or it seems to make a good case. I get in trouble if I actually start to analyze the race, actually start looking for clues in the Daily Racing Form's tables and things like that. I mean, people who know what they're doing get it completely wrong, so it's kind of silly to think I could look into all of that agate type and pick a winner. Still, it is fun to read through things such as Art Lander's analysis of the field and see if some clue jumps out. I do just as well every few years going by the name. And it's more fun that way. And it is all fun. I am not betting the kids' college savings on the race, and even if put all my betting money on the longshot to win, and he did, it wouldn't pay for a class at UK. I bet on one horse race a year, and it's entertainment. And forging those little mental connections gives me a rooting interest and makes those occasional wins more enjoyable because there was more to it than, "No. 7 looked good." So that's my system. Sometimes it works. Sometimes it doesn't. What's yours? Comment below. What can Brown do for charity? These sorts of bets are usually reserved for competing municipalities, you know where, say, Atlanta and Chicago are playing and if Atlanta wins, the mayor gets a big ol' Chicago pizza, and if Chicago wins the mayor of gets a big ol' basket of peaches. 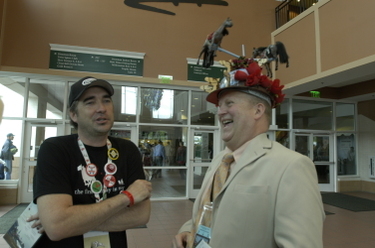 Anyway, UPS CEO Scott Davis and Kentucky Fried Chicken president Gregg Dedrick have looked at the Kentucky Derby field and seen they have something to place a friendly wager on. Davis' interest is of course in Big Brown, who is actually named after the delivery service. And you do not have to look far into the field to discern who KFC is backing: The Colonel, Colonel John, that is. If the Colonel wins, both companies will donate $10,000 to The Colonel's Scholars, which provides college scholarships to deserving students. If Brown wins, they donate $10K each to Metro United Way. If you haven't been following the field, both are considered strong contenders, with Big Brown the current favorite. UPS is actually sponsoring Big Brown. 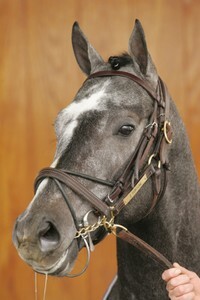 Speaking of picking the ponies, we'll have a bit on that tomorrow, and I'd love to know how you pick your Derby horse. Feel free to comment, below. Tomorrow night, like the last 10 Derby Eves, I will be spending the evening covering the Barnstable Brown Gala in Louisville. Thinking about that, I thought I'd give you a link to this post after last year's bash about the "glamour" of covering celebs at the Derby. Enjoy. 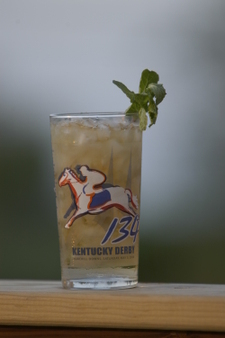 According to Churchill Downs, more than 80,000 mint juleps are served at the track on Kentucky Derby and Oaks days. That's a lot of bourbon and syrup, though at the same time, the official Derby drink gets about as much love as a Red Sox fan in Yankee Stadium. It's been called a, "mouth wash cocktail" and less complimentary names. A friend who penned a piece about reasonably priced bourbon in Nougat magazine (scroll down to p. 23) quoted Liquor Barn employee Morgan Wright saying, "Everyone should try a mint julep at least once," -- indicating that might be enough. The julep. It's a drink many people love to hate, especially around the first Saturday in May. But you won't hear that here. Despite growing up in Virginia and starting my career in Georgia, the first time this distinctly Southern drink touched my lips was the morning of the 1998 Kentucky Derby. It was one of the experiences I engaged as part of a "Derby virgin" story I wrote that year -- and a rare chance to drink on the clock. It was interesting and well worth a second try -- after I was off the clock, of course. Over the years, I looked forward to the coming of Derby season and Celeste Susany's colorful julep bottles for Early Times. On a few occasions, I even became adventurous, whipping up some julep on my own. Somehow, the first few times I worked with really complicated recipes that involved things such as mashing mint leaves and wringing them into bourbon. One of those occasions was a visit by my mother, so I figured I should serve up this signature Kentucky beverage. That had to be the strongest drink my poor mom had in 50 years. Maybe I should just go with that ET pre-mixed cocktail, I thought. But I was feeling a little bold earlier this week. Sharon Thompson ran a julep recipe in Sunday's A La Carte section -- it's the same recipe Churchill Downs prescribes -- and I gave it a shot. It was really simple, boiling up a syrup of sugar and water, putting mint sprigs in it and refrigerating it overnight. The next day, it was just a matter of pouring the right combo over crushed ice. I now really appreciate my new refrigerator which dispenses ice crushed. Several accounts, including Joe Nickell's book The Kentucky Mint Julep, actually point to the first mentions of a mint julep being in Virginia, so maybe this was more of a natural to this native of the Old Dominion. And there are nice stories about mint being a herb of hospitality and welcoming. Mint julep equals Southern Hospitality. We have a lot of visitors this week. I get it. And I like it. So, love to hate it all you want. In this corner, we'll always carry a torch for the mint julep. At the Copley residence, we did the same recipe as the Downs idea, but substituted Ale-8-One for the bourbon. I don't know if that qualifies as a julep, but my daughter liked it, and keeps the main ingredient in the Bluegrass State. Do you have a favorite mint julep recipe or story? Comment, below. 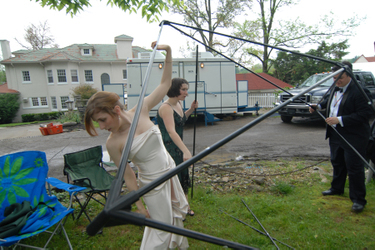 Jamie Gumbrecht, left, Angela Baldridge, and I try to piece together our canopy before the Barnstable Party. 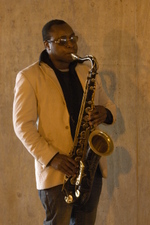 Copyrighted photo by David Perry. 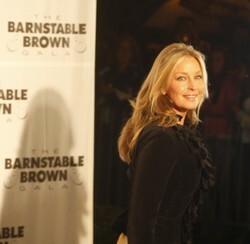 Whenever I go shopping to get prepared for the Barnstable Brown Party, I always find myself in the camping section. That's sort of what covering the party for the Herald-Leader is like: camping, in formal wear. We have some unique challenges covering Derby Eve's biggest celebrity magnet. 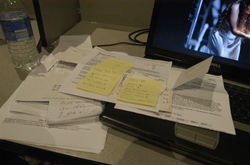 We have no home office in Louisville, but unlike most of the other print media there, we are on deadline. Photos, copy, and now video have to be flowing to Lexington. So, we have to have an office. Hence, I've turned in receipts over the years for things like a canopy tent, lanterns and fold-up chairs. Oh, and a tuxedo. Some years, we've just set up a table and a few chairs for a work station under the stars. This year, we needed every bit of the hardware and then some. 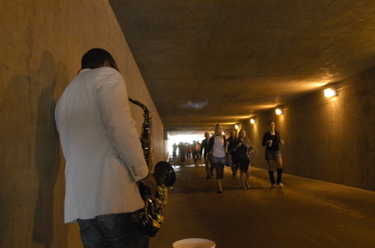 That's why I was in Wal Mart buying tarps -- I'll be sending you the bill, Uncle Herald -- for last night's soiree. And that paid off when an aggressive and extended storm blew into L'ville at about 6:30 last night. We had a five person crew last night: Photographers David Perry and Angela Baldridge, videographer David Stephenson and writers Jamie Gumbrecht and myself. Angela gets an MVP award for figuring out how our canopy should be assembled, despite the fact the instructions were somewhere in my garage, where they weren't doing us a lot of good. If it hadn't been for Angela's ingenuity, we may have been standing there with an unfinished frame when the rains came. The canopy still had a nice coat of dust on it from last year's Ichthus Festival. Yes, the gear does come in handy for an event that is more like camping camping. Since my first Barnstable party, things have changed quite a bit technologically. Where we used to have to get the phone company to set up a line outside the Barnstables for us to send stories and images, now we're all on mobile wireless cards, and the information flows a lot faster. And we keep it flowing. Usually, while one reporter and photographer are up front talking to the stars and snapping photos, the other is in the back filing images or quotes with the newsroom in Lexington. Then we hand off, sending the other scribe or shooter back to file. The Barnstable Party also used to be a little local media get together, but now, we have to elbow for room along with places like Access Hollywood and People Magazine. Click here for more on that. Sometimes, when we are trying to squeeze our ways through the party to get from the front to our work station out back or trying to piece together a tent frame, we have to remind ourselves this is a "glamorous" gig. But really, I keep asking for the Barnstable assignment because it's the only place to be Derby Eve. And I keep visiting the camping section.